I love to get outside and hike. My relatives in Norway knew this so when my wife and I visited last month they decided to take us on a hike. We had heard of a fantastic vantage point above the Lysefjord called the Prekestolen. 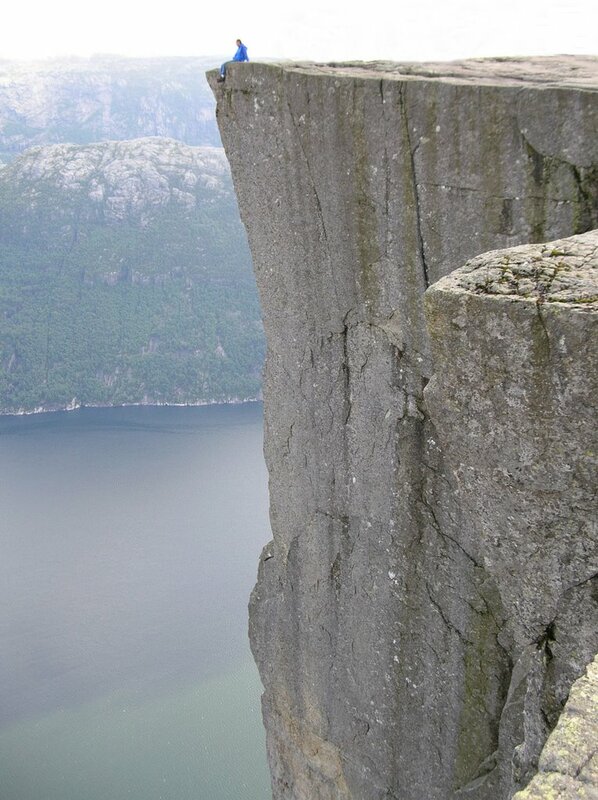 “Ah yes,” they said, “the prekestolen is just a short hike. We’d love to take you.” Their whole family, including two ten-year-old twins and a twelve year old packed into two cars and headed out into the wilds of Norway. My wife, who is not Norwegian by heritage, soon discovered a secret not much known to the non-Nordic peoples. We are descended from mountain goats. I’d like to think that I am in reasonable shape but this hike was extraordinary. Living in the flatlands of Minnesota has diminished my mountain goat heritage. At some point there was mention of the hike being four kilometers long but not being so familiar with the metric system I let it slide. After all, I’ve run a 5K race before. It wasn’t so bad, and I was running! I could handle a hike up a hill. As it turns out, it was more like six kilometers and this wasn’t a hill. Running was out of the question. If a Norwegian ever offers to take you on a short hike, beware. “Short” is a subjective term relative to the terrain in which you live as well as how far you are from your original mountain goat ancestors (assuming you have some). I have a goatee; I am not a goat. Six kilometers is three and a quarter miles. While most hiking I do at home is on nice dirt paths gently meandering through the forest, the trail to the Prekestolen was largely a skree field of boulders. Scree incidentally comes from the old Norse word Skritha meaning landslide. A lovely thing to ponder as I ascended the loose rock. The elevation gain from parking lot to Prekestolen was 1,400 feet. The trail winds up and down what a flatlander like myself would call mountain ridges but locals would probably just call hills. Due to the up and down nature of the trail, the elevation gain felt like even more than the 1,400 feet obtained by math. As I left the trees behind and walked across smooth alpine domes of rock I heard a tinkling in the air. It was the ringing of bells hanging from the necks of sheep. They watched our weary approach to the pulpit rock known as prekestolen. Drawing near I got my first dizzying view of the drop off and my heart raced with joy. This is living. The prekestolen is a sheer face of rock shooting straight up from the water of the fjord. When you stand at the edge you are looking down two thousand feet to the water below. There used to be more of these outcroppings but over thousands of years the others have all sheared off and plunged into the cold depths of the 1300 foot deep fjord. The Prekestolen itself is slowly separating from the surrounding rock and the large crack is measured each year to chart the progress. We all jumped a few times but it didn’t budge. I have always asserted that I have no problem with heights but peering over that edge, seeking the almost unfathomable distance between sky and self and rock and water, the very mortal part of my being screamed for retreat and forced me backwards. According to my estimate, it would only take a human eleven seconds to make the two thousand foot drop to the water below but I wasn’t about to check my math through first hand experimentation. The trip to the Prekestolen made me appreciate elevation in the landscape. My wife and I had to keep on apologizing for not being able to keep up with even the short legged kids who joined our trek. We needed to remind them and remind ourselves that we are essentially flatlanders. Successive glaciers and millions of years have worn the volcanic flows and limestone beds of Minnesota into a smooth rolling hilly landscape. Bluff tops and the ancient mountains of the north shore of Lake superior are the few opportunities we have here to elevate ourselves. Elevation gives you perspective on the world, it allows you to see further and it allows you to dream more.